This morning I received a copy of Jess Bier‘s recently completed PhD thesis, Mapping Israel, Mapping Palestine (Technology and Science Studies, Maastricht, 2014) – thanks so much, Jess – and I look forward to working my way through it. You can download a version from Academia here. Mapping Israel, Mapping Palestine is an analysis of the ways that segregated landscapes have shaped the practice of cartography in Jerusalem and the West Bank since 1967. Extending work on how technology is socially constructed, it investigates the ways that knowledge is geographically produced. Technoscientific practices are situated in spatial contexts which are at once both social and material. This situated character influences the content of knowledge in ways that can be unpredictable. Therefore, it is necessary to reflexively engage with materiality in order to enable landscapes that allow for more diverse practices and forms of knowledge. The complex geographies of Palestine and Israel provide central sites for the study of how landscapes shape the form, content, and circulation of knowledge. 1967 marks the beginning of the Israeli Occupation of the Palestinian Territories, including the West Bank and Gaza Strip. With the notable exception of East Jerusalem, currently most of the occupied areas have been neither formally incorporated into the Israeli state, nor have they been allowed to form an independent sovereign nation. Instead, small pockets of Palestinian control have been carved out through a series of international negotiations aimed at clearly defining separate states for Palestinians and Israelis—negotiations which often take place over tables strewn with maps. Yet even as maps are employed in attempts to end the Occupation, similar methods have been used to build intricate infrastructure networks for curtailing human movement within the Territories. These include the 8‐meter [high] Wall which snakes through the West Bank, segregated sets of roads and buildings, as well as roving series of checkpoints and roadblocks, all designed with the purpose of confining Palestinians and separating them from Israelis. The planning, construction, and administration of such systems of control are made possible by the same Geographic Information Science (GIS) mapmaking practices which are used in attempts to ameliorate the conflict. To understand how this is possible, it is necessary to explore the ways that such practices are differently incorporated throughout the very region which cartographers seek to map and reshape. The centrality of maps to debates over the future of Palestine and Israel has only intensified since the advent of digital cartography has led to increasingly minute forms of surveillance and control. Contemporary cartography incorporates a range of practices in Jerusalem and the West Bank, from adaptations of decommissioned spy satellite images to a road map made by Palestinian students who tracked their own movements on their mobile phones. Intended to display objective facts, empirical maps often inspire extensive discussion. Participants in these discussions exhibit a variety of observational frames that cannot be divorced from their unequal positions and mobilities within the very terrains that they seek to portray. 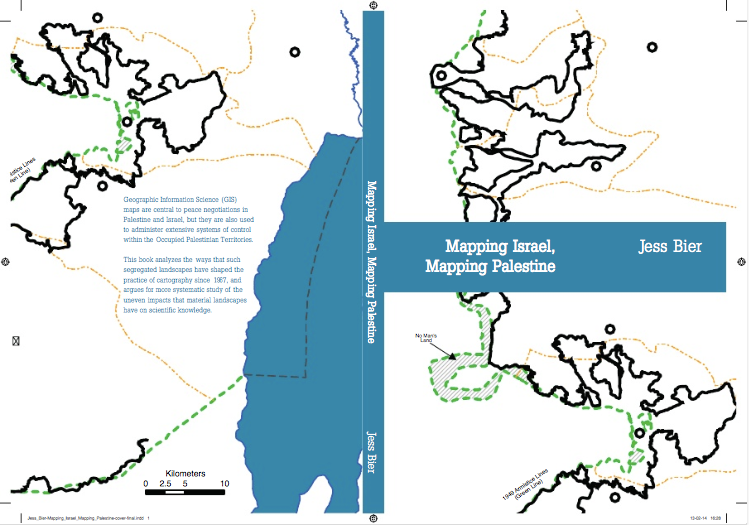 Mapping Israel, Mapping Palestine addresses these issues by presenting an analysis of the empirical maps and mapmaking practices which result when diverse cartographers travel to chart the same landscapes that so condition their movement. As such, it investigates the myriad ways that the segregated landscapes of the Israeli Occupation shape the conditions of possibility for knowledge about the Occupation and its effects. This is really important work (see also the presentation by the Foundation for Middle East Peace here), but in addition to maps and digital captures of occupied Palestine – the plethora of lines on maps – there are other operational dimensions to mapping. I’m thinking in particular of the IDF’s target maps. You can find a report of its ‘target bank’ for southern Lebanon in 2011 here – ‘many time larger than it was in 2006’ – and Craig Jones‘s discussion of surveillance, imagery and targeted killing here. This apparatus is in full play during the present military offensive on Gaza, which (like all the others) involves the production and destruction of targets through the mobilisation of cartography. There may well be a map of pain — but the pain is also produced through mapping. This entry was posted in cartography, Israel/Palestine and tagged cartography, Gaza, GIS, Israel/Palestine, Jess Bier, maps by Derek Gregory. Bookmark the permalink. That really would be worth doing, Jess – let’s keep in touch. Thank you for posting this! The point about the pain produced through military mapping is well taken. I didn’t include IDF maps because there wasn’t space to do them justice (!). They merit a separate project, which I would love to do some day.